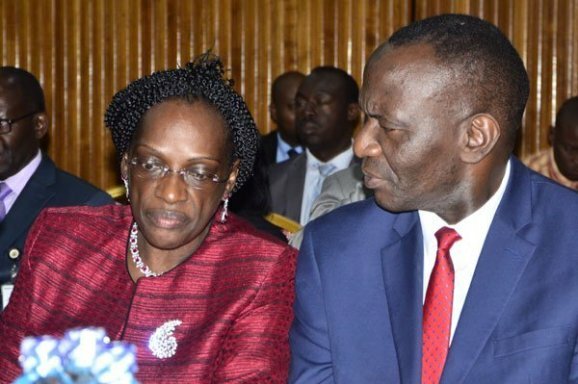 KAMPALA – The Former Bank of Uganda Executive Director Bank Supervision, Justine Bagyenda has confirmed having carried out bags of documents from Bank of Uganda but insisted that the items carried out were personal and involved plaques she obtained in her Banking career. Bagyenda made the statement today while appearing before the Committee of Commissions, Statutory Authorities and State Enterprises (COSASE) when the MPs tasked her to explain the contents of the bags her staff carried out. The probe into Bank of Uganda’s stolen documents came after accusations that on 11th February 2018, Bagyenda’s with the help of her bodyguard Juliet Adikolet and driver Dan Turyahabwe sneaked out bags of unknown items without passing through the security of the Bank. When asked by Abdu Katuntu, COSASE Chairperson what documents she carried out, Bagyenda first protested to answer demanding to have a look at the CCTV Footage that the Committee relied on to accuse her, but Katuntu insisted she first answers questions before having to access to the footage. She laid agreed to reveal the contents of the bags saying; “The bags had my personal documents, I had MBA books, I had plaques they were so many of them, I had pictured. I had materials which I got from all the conferences I used to a consultant in IMF, World Bank. There were also files for The Finance Intelligence Authority where I was a board member, there were also files for the Micro Finance Support centre where I was a board member for six years,” Bagyenda said. Katuntu also lashed out at Bagyenda for playing the victim in the Bank of Uganda probe yet many accusations before the Committee indicate she had a hand in these, despite complaining of not being treated fairly. Bagyenda had also demanded to have the Governor, Deputy Governor, Executive Director Administrating, Director Security, Director HR, the consultant for security and the personal assistant of the Governor to be present during her grilling arguing that allegations c brought against her happened when she was still in the bank and these were her bosses.